“I now call it vital reserve, so in you and in me, in every cell, in every organ, in every tissue, there is a metabolic reserve, a strategic reserve, a vital reserve. Now, when you can find out where that has broken down, you can coach it up and so, that is how we lead people to health,” Reed Davis. Davis has now spent some fifteen years running the lab work of sick people, including saliva, urine, stool and blood tests, to refine and systematize his unique objective approach. While having the utmost respect for their profession, he emphasized that he is not a doctor, so he cannot treat or diagnose disease, but prefers instead to focus his clients on a path that will encourage the body to heal itself. Test results and intake history are combined to individually customize the D.R.E.S.S. program for each client. One of the key elements is often a focus on stress reduction, which can range from toxic people in a clients life, to food sensitivities or toxic chemicals, such as pesticides and herbicides. Davis cautioned that our world is now so inundated with information, transformation is the only path to lasting change. His tailored behavior program typically takes from 90 to 180 days. “So, in your body, when we are subjected to the environment, all the stuff that’s in our food, and the mental/emotional stressors, plus, all the physical stress of having bad posture, weakness, car accidents, sports injuries, all these things add up, and they take a toll on your body. And so, we straighten that out, and we get everything lined up, and we give you things to do, and if you do them, you are going to be better on the other side,” Reed Davis. D.R.E.S.S. 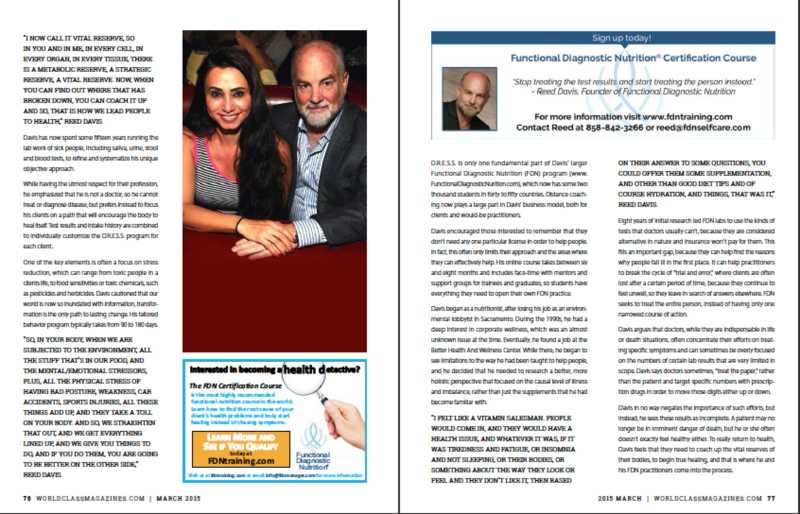 is only one fundamental part of Davis’ larger Functional Diagnostic Nutrition (FDN) program (www.FunctionalDiagnosticNurition.com), which now has some two thousand students in forty to fifty countries. Distance coaching now plays a large part in Davis’ business model, both for clients and would-be practitioners. Davis encouraged those interested to remember that they don’t need any one particular license in order to help people. In fact, this often only limits their approach and the areas where they can effectively help. His online course takes between six and eight months and includes face-time with mentors and support groups for trainees and graduates, so students have everything they need to open their own FDN practice. Davis began as a nutritionist, after losing his job as an environmental lobbyist in Sacramento. During the 1990s, he had a deep interest in corporate wellness, which was an almost unknown issue at the time. Eventually, he found a job at the Better Health And Wellness Center. While there, he began to see limitations to the way he had been taught to help people, and he decided that he needed to research a better, more holistic perspective that focused on the causal level of illness and imbalance, rather than just the supplements that he had become familiar with. “I felt like a vitamin salesman. People would come in, and they would have a health issue, and whatever it was, if it was tiredness and fatigue, or insomnia and not sleeping, or their bodies, or something about the way they look or feel and they don’t like it, then based on their answer to some questions, you could offer them some supplementation, and other than good diet tips and of course hydration, and things, that was it,” Reed Davis. Eight years of initial research led FDN labs to use the kinds of tests that doctors usually can’t, because they are considered alternative in nature and insurance won’t pay for them. This fills an important gap, because they can help find the reasons why people fall ill in the first place. It can help practitioners to break the cycle of “trial and error,” where clients are often lost after a certain period of time, because they continue to feel unwell, so they leave in search of answers elsewhere. FDN seeks to treat the entire person, instead of having only one narrowed course of action. Davis argues that doctors, while they are indispensable in life or death situations, often concentrate their efforts on treating specific symptoms and can sometimes be overly focused on the numbers of certain lab results that are very limited in scope. Davis says doctors sometimes, “treat the paper,” rather than the patient and target specific numbers with prescription drugs in order to move those digits either up or down. Davis in no way negates the importance of such efforts, but instead, he sees these results as incomplete. A patient may no longer be in imminent danger of death, but he or she often doesn’t exactly feel healthy either. 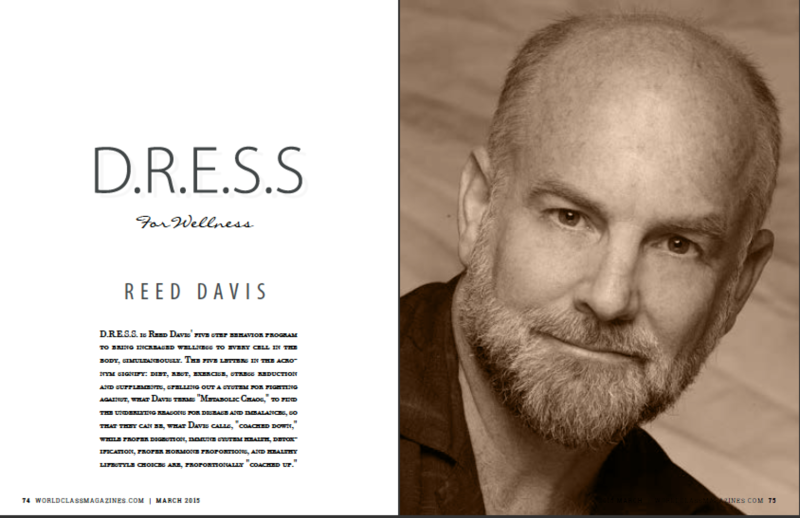 To really return to health, Davis feels that they need to coach up the vital reserves of their bodies, to begin true healing, and that is where he and his FDN practitioners come into the process.